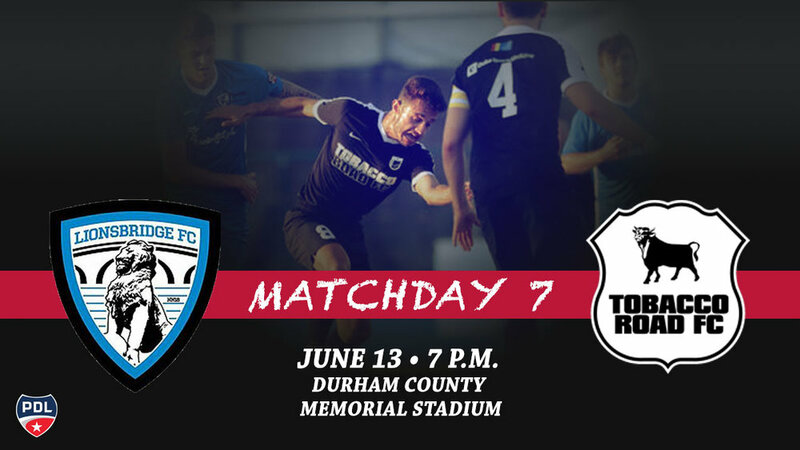 DURHAM, NC – Tobacco Road FC hopes to break it’s streak of poor form as it returns home from it’s three-match stretch away from home as it hosts Lionsbridge FC in Premier Development League action. The match will be at Durham County Memorial Stadium at 7 p.m. on Wednesday, June 13, 2018. Tobacco Road FC last faced Lionsbridge less than a week ago on June 6. The match was at Pomoco Stadium in Newport News, Virginia. The hosts played exceptionally well and handed Tobacco Road their worst loss of the season by a margin of 6-0. This win gave Lionsbridge FC their first South Atlantic Division win. Currently in the South Atlantic Division Standings, Tobacco Road FC sits in fifth with six points on two wins and four losses. Lionsbridge is one spot ahead of them with nine points on two wins, two losses and three draws. Lionsbridge is looking to capture their first division win as their divisional record is 1-2-1. Tobacco Road FC is coming off participating in the Region III Amateur Championships in Raleigh, NC. Tobacco Road won their group and faced Kickers FC (FL) in the semi-final. The game featured varying styles of play as Tobacco Road possessed the ball more while Kickers relied on the counter attack. The match ended in the Kickers favor by a score of 2-1. Lionsbridge FC hosted the Charlotte Eagles in Newport News, VA. In a scoreless draw, the hosts outshot the visitors by a margin of 16-7. Each team’s goalkeepers had five saves. Wednesday’s match will feature a 50/50 raffle. Tickets will be sold one ticket for $2 or three tickets for $5 and will be available for the raffle at the gate. In addition to receiving half of the money collected the winner of the raffle will also receive a Tobacco Road FC scarf. Along with the raffle, there will be another chance to win a scarf. A winner will be randomly selected to receive a scarf during half-time of the match. To enter the drawing, simply follow Tobacco Road FC on Facebook and respond “going” to the event. Boricua Soul will be at the match for fans to take advantage of. Boricua Soul is one of the top food trucks in the triangle. Their menu features a unique fusion of Southern Soul, Caribbean Flair, Euro-African Roots. Check out their website here: https://boricuasoulnc.com/. The match between Tobacco Road FC and Lionsbridge FC is Wednesday, June 13 at 7 p.m. at Durham County Memorial Stadium in Durham, North Carolina Tickets are available online at https://www.tobaccoroadfc.com/single-game-tickets/. A live stream will also be available through YouTube. The link for the live stream will be posted closer to game time on Twitter and Facebook.